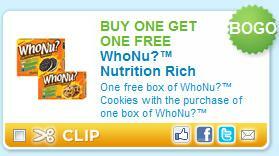 Coupons brought back the buy one get one free coupon good for Free WhoNu? Cookies. Click here, use the zip code 77477 and click the “Food” category to find it faster. You can also click here to find the store nearest you that sells these. It sends you to the big coupon site, and it is not there……anyone? Sorry went through the coupons offered twice saw no coupon for Who Nu?